This is Trial Version. Get FULL VERSION HERE. If you need to re-design a new game purchased from Envato Market, Chupa Mobile or any other market. Then this tool can save your money spent on the projects on such market. This is awesome application made in Java and runnable on any OS which supports Java Run Time Environment. This is a Trial Version only. And will only support Sprites preview. But will show you all the sprites within the software. This trial version cannot merge sprites. However you can check your Plist files and see if this software supports your Spritesheet. We suggest you check the video tutorial as well. 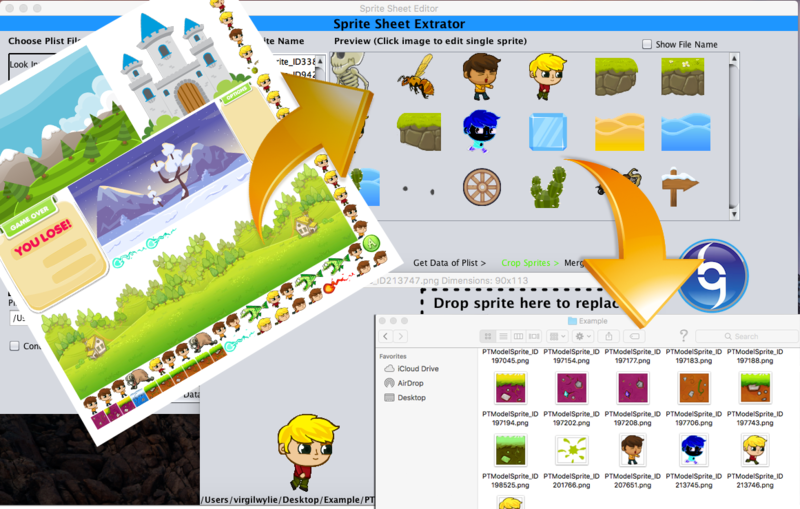 – View all the sprites in spritesheet in the software window. – UI of the Full Version. – Merge Back only supported in Full Version. – Compatible with Texture Packer Plist and Build Box Plist files. – Preview all the Sprites present in the file. 2: If plist file doesn’t contain sprite names with format “.png” then you will need to uncheck the “Contains PNG Sprites” before setting it. 3: Enjoy your cropped sprites. Edit them and Merge back in the same position using this same software. Execute the PlistEditor.jar file in the Dist folder. 1. It helps edit a BuildBox project without the need of Buildbox which costs approx $99/month. 2. Some one sold you a game source code and you dont have the Texture packer project files to edit the sprite sheets.